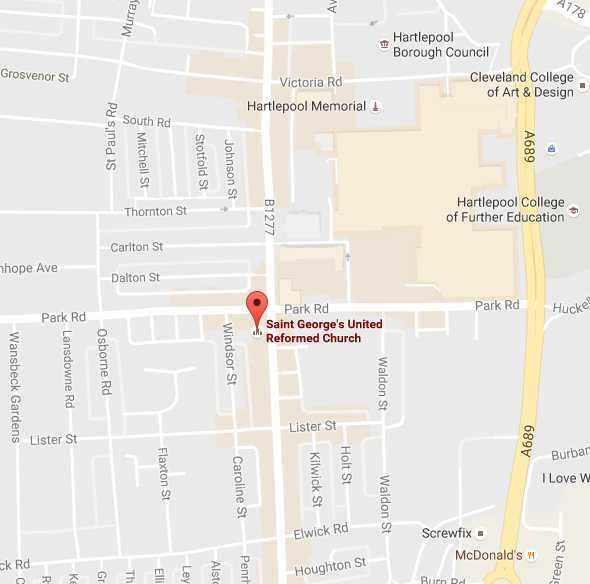 Hartlepool town centre and the location of St. George's URC, on the corner of York Road and Park Road. At the top of the slip road, turn right at the roundabout and straight ahead at the next two roundabouts – you will now be on a dual carriageway (A689) that leads all the way into Hartlepool. Carry straight on this road for about 5 miles. En-route you will pass on the right the Owton Lodge Public House, Tesco`s Supermarket and McDonald`s. Shortly after McDonald`s (300yards) you will come to a set of traffic lights – here, please turn left. You are now on Park Road and entering the main shopping area of the town. At the next set of traffic lights, turn right, this will bring you into a series of Car Parks. You can see St George`s from these, it is situated on the corner of Park Road and York Road. Take the A179 turn off for Hartlepool. At the top of the slip road turn left. Carry on this road, which will leads you to a steep bank at which there is a roundabout at the bottom. Carry on this road for about 3 miles until you come to the second set of traffic lights. Here turn right, (the turn is sharp and you immediately start to climb a steep hill). This is Wooler Road, continue along this road until you come to the first set of traffic lights.